Giveaway Time –> Happy Blogoversary to Moi!!! February 4th marks my 1 year Blogoversary! It is hard to believe that a year has passed since I became sucked in addicted welcomed to the wonderful and wacky word of blogging.So much has changed during this year. I am no longer teaching, I am a stay at home Mommy to my two little boys (NHL 4 and JSL 8 months). This has changed my life the most. I am not stressed like I was a year ago (the stress is just different now). I have time to spend with my boys and I enjoy doing things that I want instead of lesson planning and correcting papers in my spare moments outside of school. I do miss the kids and my fellow teachers, but at this point in my life this is where I need to be – with my husband and two boys. I am going to take a minute to thank some important people. Please excuse me if I forget someone, it is not intentional. Very little sleep this weekend can cloud my memory banks –> teething is EVIL I tell you! Laura – thank you for helping me to set up my original LJ blog. I kept reading yours and wanted to try something to release my stress from life at that time. So now you are technically to blame for the blogging addiction and the renewed knitting fascination. My Porkloving Cousin – you may not know this, but you were a HUGE inspiration. I used to squeal when I would read your latest entries. I can not wait to read the book that you author someday. I expect an autographed copy when it comes out – do not forget that! All of my S3Mommy, May07 and Local Mommy Group friends with blogs (Sandy, Nancy, Renee, Kmelion and others) – You read, you commented, you helped me to explore my writing style. . . you are the best! Kim – Thank you for introducing me to the Swaparooni group. What fun I have had with this amazing Flickr group thanks to you telling everyone all about it. Mrs. OMSH – the founder of the Swaparooni group who helped me to make some amazing bloggy people (CityStreams, Airing My Dirty Laundry, Coolbeans, Bethany Actually, SAJ, Dutchblitz and so many others). Heather, you have inspired me with your fun, fresh and real blog to be myself and let my sarcastic and fun side show. Plus I have to include lots of photos of my kids and things. Thank you for being an inspiration. You and Jessica are two of my mentors (there are others too – so no hard feelings for not mentioning all of you now). My boys – for giving me things to write about, photos to take and being super cute subjects for Mommy to use on her blog. While roaming around the Blogosphere I have found so many other blogs that I try to read daily (thank you Google Reader). There are too many to mention here and I am working on a new blogroll to give everyone some linky love. One of these blogs is Rocks In My Dryer. 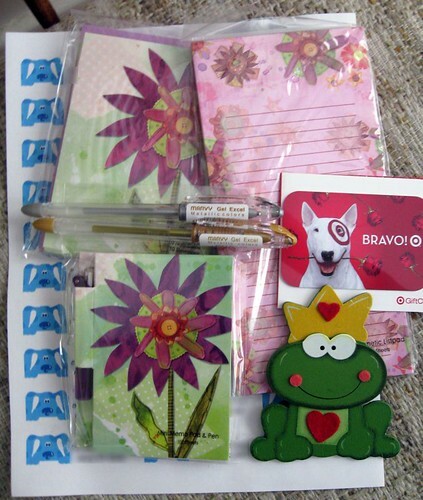 Shannon has another blog that showcases giveaways – perfectly titled Bloggy Giveaways. This fall she helped to arrange the Fall Y’All for people. This week she is organizing a Bloggy Giveaway Carnival. The timing is perfect with my Blogoversary so I am joining in with my first giveaway!!!! Included: (1) A sheet of custom made address labels. I will put whatever you would like on them – you do not have to use Blue the dog. (2) A package of 10 blank note cards (3) A little memo pad with a pen (perfect for keeping in a diaper bag or purse to capture bloggable moments). (4) Magnetic Listpad (5) Gold and Silver metallic gel pens. (6) Valentine froggy magnet (7) $5.00 gift card for Target to get a little something special for you. Other surprises may get tossed in along with these, but these are definite. To enter all you need to do is leave a comment. Only one comment per person and please tell me something about yourself. Do you blog? If you do. . . why did you begin? If you are not a blogger – why not? Come on you know you want to blog – see peer pressure exists even in the Blogosphere! Any duplicate entries will be deleted and not eligible. Please be sure to leave your e-mail address and/or blog so I can contact you for your information when you win. A winner will be randomly selected from all of the comments by Random.org (no trees will be killed in the making of this giveaway). Entries will be accepted until Midnight EST on Saturday, February 2, 2008. I will announce the winner here and post it on Shannon’s website during the day on Sunday, February 3, 2008 (the day before my 1st Blogoversary). Unfortunately, due to being a SAHM and living on a budget, I must limit entries to people who are living in the United States and Canada only. Sorry to my other international friends, but man shipping charges are just crazy these days. With that I hope you enjoy this and look forward to meeting new friends out there in this fun filled Bloggy world that we live in. Comments closed 2-2-2008 . . . winner announced very soon!!! « They used what with 3-5 year olds? I started blogging almost 2 years ago because I wanted to travel the world from my computer chair:-) Congratulations on your Blogiversary!! Please enter my name in your giveaway:-) Thank you! I blog so that I can document our adventures of being a home schooling family; my family out of state can keep track of us. It also allows me a place to show off my crafts. I would love to start blogging, it’s just hard to find the time! Please count me in your contest! TY! I don’t blog–but I still write letters…. Love the stationery! Something about me… hmmmm…. love to go to garage sales! You never know what treasures you might find at them. I have a blog but an not very good at keeping it updated. I guess that’s why I was slow at jumping on the blog wagon. Thanks for the chance at the giveaways. Hey, we use a similar layout ;) Anyways, I am an entertainment blogger and I do it for one reason: I LOVE talking about tv, movies, music, etc. It’s pretty much my life so why not share it with others? I just started blogging. It is a place to organize my thoughts and life. those are cute! :) thanks! I am not a blogger yet. I have been reading blogs for awhile, and have been considering starting one. I just haven’t gotten to it yet. I have a new baby, and time is not something I have much of lately. I am a blogger…..and becoming more addicted by the day. This giveaway contest is making me even more so! ;-) Great giveaway–thanks for entering me. All things I would love to have! Thanks! Check out my giveaway – Mary Kay Product!! Not a blogger yet, but keep thinking about it! i LOVE blogging. it’s the only thing that has kept me sane through TWO deployments. Yes I am a blogger and I love the people I have met doing it. I’m a blogger and I started b/c it seemed like so much fun….I still think so too! P.S. Pick me, pick me!! I hate bananas but love banana bread. Go figure. lol. The reason I started blogging last year is because I had a dream (divine in nature) that I should do something that was named “The Canvas Grey” related to the internet. Very nice giveaway, thanks! So cute. Count me in! I just started visiting different blogs about 2 months ago, and really enjoy it, so I am going to try to set myself up with a blog soon. yes I blog; I’m addicted. Been doing this since May 2005. please count me in. thanks! I blog…mostly to share the information I find, and get advice from others…that ends up being the case for personal finance blogs, I guess. Oh how sweet! I love this little gift. Thanks so much for the chance to win it! Yes, I blog! I’ve had my family news and pictures blog for about three years and just started my other one (This Wasn’t In The Plan) three months ago. The first one is to keep family and friends updated, then I realized I loved writing for an audience and wanted to have a blog that might appeal to more people, so I started the other one. I am a blogger! I started blogging when my son was born to update friends/family with pictures, etc.! I’m not a blogger because I stay too busy. I started blogging to document our journey to our 2nd daughter from China. I then branched out into doing a book blog, a sewing blog, and now a kniting blog. I don’t post a lot but I try to at least a few times a month. This contest is so much fun, and you have a great giveaway. Even if I don’t win, it was nice to visit! Great giveaway and blog- please include me in the drawing. I don’t blog. If I did, it would be infrequent, and those who read it would want to put me on some sort of medication. I don’t doubt that for a minute. Maybe I should. It looks like fun. Well Happy Blogiversary to you!! i am a SAHM to three, and i blog to keep track of milestones in our lives. thanks for the entry! We started our blog last March when we brought our daughter home. We have family spread all over the country and it seemed like the easiest way to keep them all informed about her milestones and updates on her adoption. Now both my husband and I are addicted! It would be so nice to use these to write to my mom (who still expects written letters).